Kirstin’s advice to young people is to keep their options open and get stuck in; that in IT qualifications aren’t everything. There is no substitute for work experience, even if unpaid, to help young people find out what they really want to do. The combination of practical experience plus a clear sense of what you can contribute, what you can achieve, is very powerful. Kirstin Duffield was born in Windsor in 1970. Her mother was an award winning businesswoman who had set up a successful language tutoring service for businesses in the 1970s and her father was a computer programmer developing systems for Transport and Lloyd’s of London Insurance enterprises. Computing was part of life: she had an Amstrad which her father dismantled once while she was away at school, she took an O level in IT, all done in BBC Basic, and was one of only three to go on and do an AS level in computer science at her school. She attained one A level and two AS levels, Maths, Economics and computer science, but her most significant achievements at school were in sport, where she represented the county at swimming, tennis, and lacrosse (which she also played at national level), and Brighton and Hove at athletics. After A levels she applied for a pre-university course at IBM and also a degree course at Oxford Polytechnic. 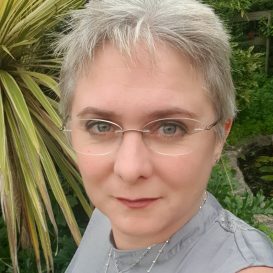 By playing one off against the other she was accepted for both and, deferring the degree course for a year started at IBM Basingstoke in 1993, the only woman in the IT Support team of 60. She started her degree a year later in 1994, initially doing double microelectronics, but swiftly changing to computer science and Cartography. She loved it. Although she really enjoyed her degree, Kirstin wanted to interact with people and not just computers, so for her first job she started in the marketing department of an IT company. She ran all the marketing databases but found the content really interesting so completed a marketing diploma at Brooklands College in her spare time. She set up her own IT training consultancy, got married, and moved to Dorset where she expanded her training operations: moving 400 staff at the district council up from Windows 3.1 was quite a challenge so she took on extra staff. Kirstin had her first child around this time and was expecting her second in 1999. In 2000, six weeks after the birth, her husband had a very serious motorbike accident. They were both self employed so they had no income. She borrowed £2,000 from her parents and made a conscious decision to become the main breadwinner. She started doing more for her father’s software firm, Morning Data. She could complement her father’s technical skills with people skills and she travelled up to London to familiarise herself with the insurance market (the customer base for the software). She also did CII courses to develop a thorough understanding of the industry. She quickly realised that they had a really good product and by 2005 she reached a decision point: to get more involved and grow the business. At this point her parents decided they wanted to give her the whole business and her husband was still undergoing a string of operations following his accident. She was delighted but it was challenging – she learned some hard lessons about customers who did not always pay on time, cash flow and balance sheets. When asked how she coped a husband still in post crash treatment and two children, she considers that she had no other option and the lack of choice actually made the situation less stressful. She feels the same now that she has been diagnosed with breast cancer – when there is no choice about something your route becomes simpler. On reflection, Kirstin considers that her ability to blag, to glean and connect up disparate bits of information has been an asset. However she has also put commitment into researching things properly – for instance doing a compliance course to establish how their products could support customers. She also thinks that her insistence on understanding the customer perspective has been critical and she drills this into her staff. Understanding the client means that the business relationship becomes a genuine partnership which encourages loyalty. Kirstin’s family firm, Morning Data, employs 24 people including part timers and flexi timers and she has just made two senior appointments – a director and non executive chairman. The former brings the board to three and the latter will bring long experience and provide stability and strategic guidance, especially in areas where difficult decisions might need to be made. She feels the balance is right and retains a very clear vision of what the company should be: niche, adaptable, flexible, supportive and clean. Kirstin has received many awards and accolades but perhaps the most important was the Women in the City award in 2012 where she was highly commended. The moment when she compared her achievements with those of the winner became a pivotal point in her career, because she was forced to realise that she could be really good at what she did. In terms of philanthropy, Kirstin wanted to do something that would deliver direct results; a project that differed from the usually charitable giving route. The company sent money to a client in Africa to buy goats for widows in Eritrea: unlike aid, livestock could help form the basis of a herd and provide long term income. Another initiative, on a more local level, was to install the internet line for the village hall back in Dorset. Kirstin uses social media, especially LinkedIn for networking and Strikingly for blog posts and other content. She finds herself a bit behind the curve though in other areas of social media, but the industry she serves is several eons further behind that too. Corporate information goes out through the company’s website as she like to keep personal views and market information separate. She recently commented on the impact of technology on Lloyd’s, where new operating models are set to be introduced that will replace the traditional face to face broker-underwriter relationship with an online platform. The impact on this small, introspective and highly traditional market and on the Lloyd’s brand itself could be very significant, especially with Brexit in the mix. Gender and diversity: Kirstin’s advice to other women is to remember that there is no real difference, women should just be themselves. Although men sometimes block opportunities for women through fear, culture, tribal instincts etc., it is often women themselves who are barriers. She urges women to be absolutely clear about their goals and never to doubt their abilities. Confidence is key. From her own perspective she was blissfully unaware of gender issues so they were never a barrier. She considers that you can access the old boys network if you put your mind to it. The important things are overcoming unconscious bias and the perennial sense of inferiority that seems to haunt women in particular. She feels that you must always believe that what you want is perfectly achievable. Mentoring: Although Kirstin considers that working in small companies has been invaluable in terms of what it has taught her about business she also thinks that mentoring is hugely important. Five people stand out in this capacity, including a Past Master of the Livery company who had built a similar company, a person who helped her get on with things, another who provided market knowledge, plus other people who might not have been aware that they were mentors in one form or another. Kirstin also mentors people and has found the experience intensely rewarding. Sharing lessons: Kirstin is now in a position of influence and she tries to share these lessons with young people embarking on their careers. She emphasises that people need to be prepared to learn and go on learning, that you have to look after staff in terms of their education, family demands etc. and provide consistency, stability and support if you want loyalty and longevity. As hers is a small company she always pitches in, regularly answering the phone. When people come in to do work experience she makes sure they have learned something valuable in that time. Her advice to young people is to keep their options open and get stuck in; that in IT qualifications aren’t everything. There is no substitute for work experience, even if unpaid, to help young people find out what they really want to do. The combination of practical experience plus a clear sense of what you can contribute, what you can achieve, is very powerful. Technology impacts: Kirstin considers that technology empowers people but it often does it unnoticed, by stealth. She personally loves to identify and analyse patterns in data and she constantly reminds customers that the real value is in the data, not the software. She observes that there is still a gulf between computing expectations at home and in the workplace and the only change in the last 20 years is that most people now have access to more powerful computing resources at home instead of at work. Kirstin gets most enjoyment from normal things – happy staff, happy children, domestic comfort. Her main aim is not to mess up – as this is always possible in business. Looking back at the company, her most positive experience was finding a route to raising finance that allowed the software to be leveraged as security rather than having to give away shares. Her most negative was, early on, losing their first large client which took 28% off the top line. Everyone took a pay cut and they survived. In retrospect it was a great lesson in not being too complacent, too dependent and in being agile and flexible. When she takes on staff she makes a point of ensuring that they have adequate market knowledge and then she tries to support them as much as possible in their development. She sees it more in terms of partnership than employment. When asked about less documented aspects of her life, she muses on the difference between the way that one is perceived externally as dynamic, with strongly held views, and the internal reality, where there is more vulnerability and things are less clear-cut.